What is my favorite building in Toronto? It is definitely NOT the Royal Ontario Museum (ROM) building (http://www.rom.on.ca/en). My architecture style leans towards more clean lines and “site specific” buildings, which translate as buildings that correspond to surrounding area. When I start working on designing the buildings, my first instinct is to think of the building and how that building will work with the neighbouring area. 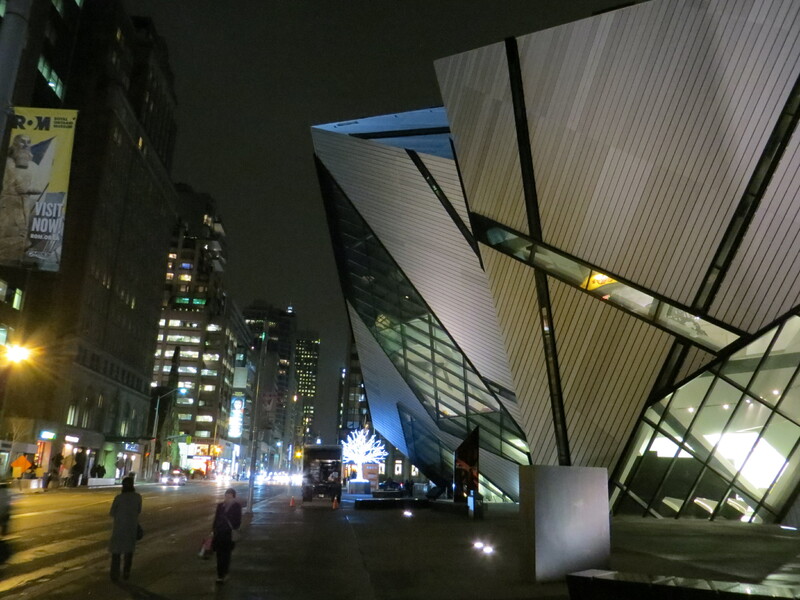 However, the ROM seems to “ignore” all the surrounding elements: old existing stone building coming right next to new building, triangular piece of building jutting out to sidewalk, random shape of windows pointing to many different directions, etc. However, something happened a couple of days ago, which made me change my mind about the ROM(which does not happen often). 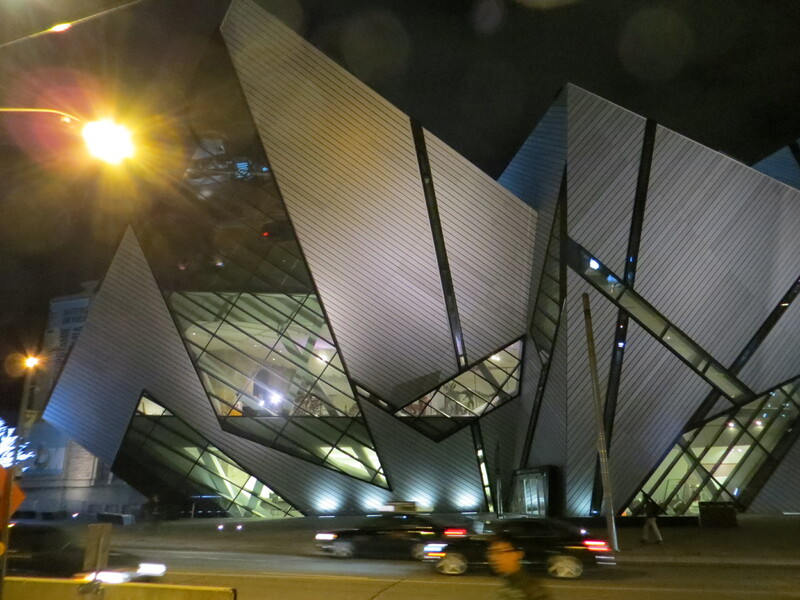 I was passing by the ROM building at night in contrast to daytimes, I had seen the building in the past. Maybe it was the lights around the building, holiday lighting decoration on the trees, or even some of the colorful lights coming from the ROM….whatever the reasons happen to be; the building looke stunning! The seemingly “ignoring” elements I did not care for during the daytime seemed to work at night: pointy building pieces, old stone building next to new aluminum panel with diagonal joint lines, part of new building roof(?) cutting into the existing ROM stone building all seems to work, or at the very least the new pieces seem to enhance the old part of the building. 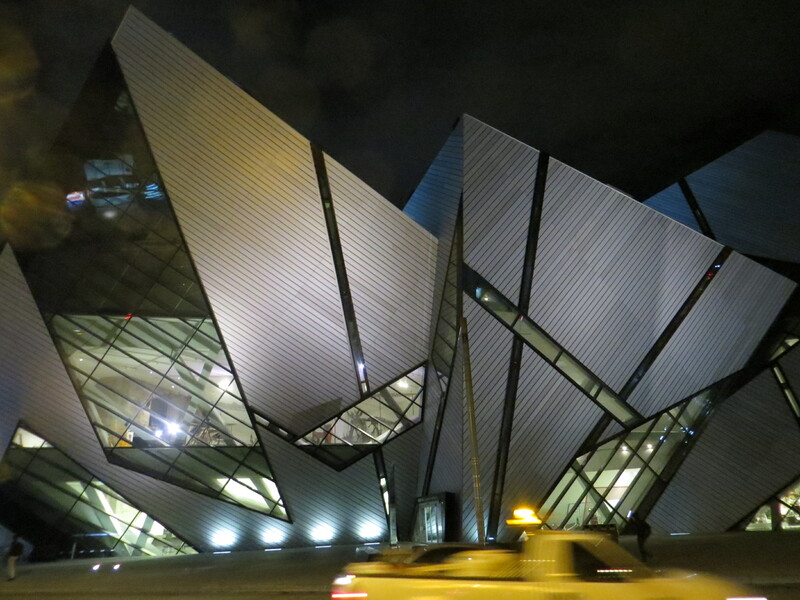 I have to admit the idea of “fitting” into surrounding area is not as great as “enhancing” the surrounding area: the ROM not only can stand on its own as iconic Toronto building, but it definitely helps to enhance the great part of Toronto.